Tycho is a relatively young crater near the southern pole, the center and source of the Moon's huge southern white streaks visible from Earth. 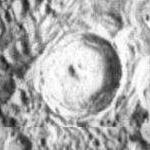 Tycho was featured in 2001: A Space Oddysey. crap. Well, you can't hate a guy for tryin'. Yeah, good try. I guess http://moon.google.com/maps?ll=-43.3,-11.2&spn=20,20 gets filtered? And we're still debating whether to add additional categories to moon entries, or to segregate them in the single Moon category to avoid confusion. And the admission tool should accept moon links now.